BPA, PTFE & PFOA-FREE HEALTHY CERAMIC COATED SURFACES: Enjoy the peace of mind knowing that you are cooking with CHEMICAL-FREE Ceramic Coated surfaces (POT & BASKET). Ceramic coat is extremely DURABLE & CLEANS with EASE! WILL NOT PEEL under high temperature Or SCRATCH easily! COOK WITH 4.0L POT OR 3.5L BASKET: Bake, Grill, or Fry foods the HEALTHY way with Multi-purpose 4.0L Ceramic Coated Pot OR with the Versatile 3.5L Basket with true detachable handle For EASY DISHWASHER CLEANING. ADVANCED PRE-PROGRAMMED SETTINGS: Features 7-in-1 Pre-programmed One-touch Settings and a programmable cooking timer of up to 30 minutes and a temperature control system with a range of 175 °F - 400 °F. FDA & ETL CERTIFIED: High power 1400W with Enhanced Turbo Air flow. 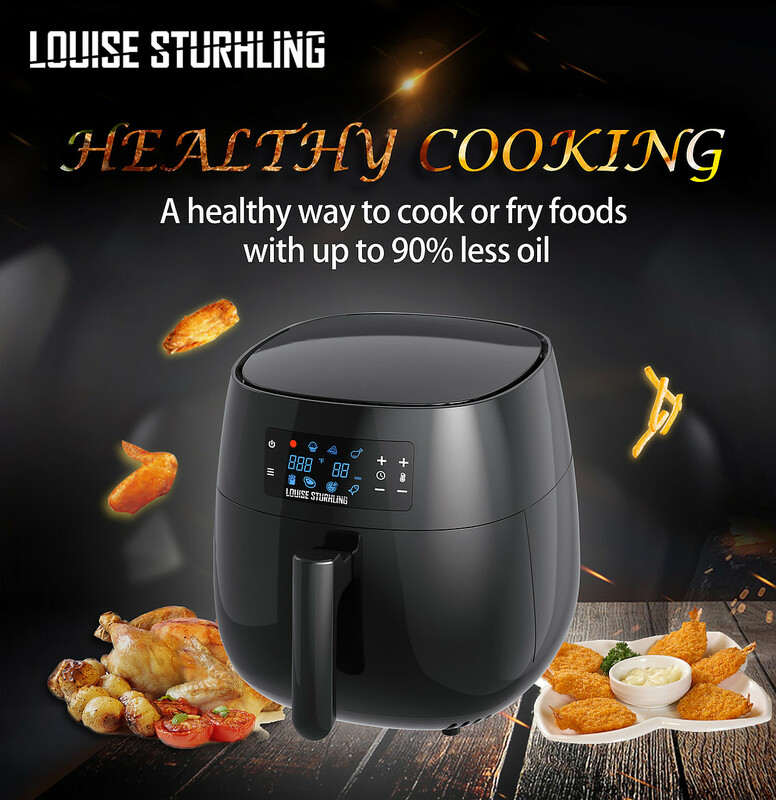 A healthy way to cook or fry foods with up to 90% less oil. Certified by FDA and ETL. BEST WARRANTY PLUS THREE EXCLUSIVE BONUS ITEMS: Enjoy Our Industry Best 60-day Returns and 18-Month Warranty. 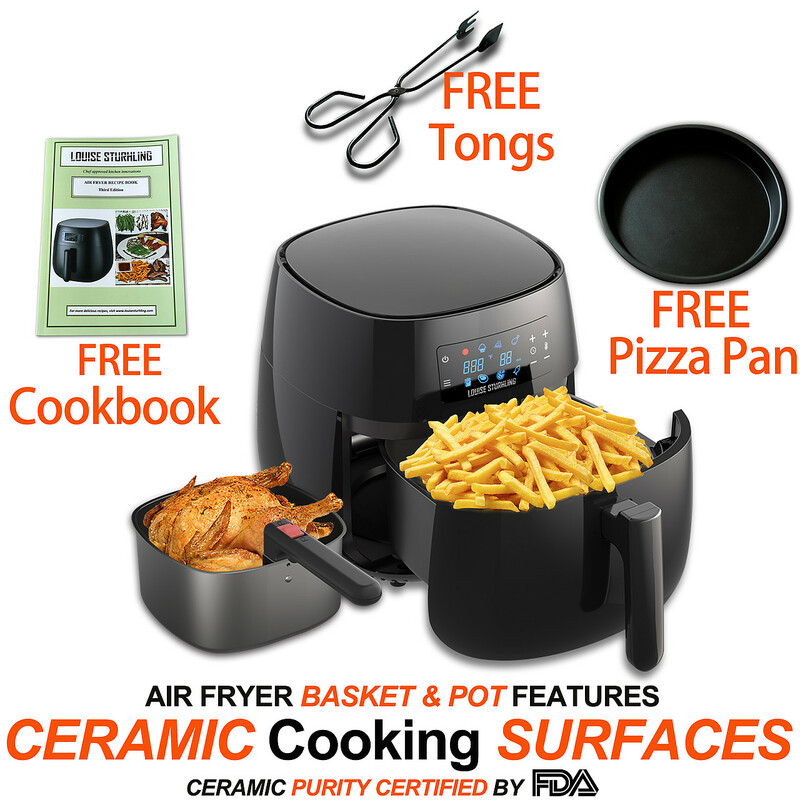 Plus, Exclusive Bonus Accessory items: FREE Tongs and FREE 7.5-inch Pizza pan Plus FREE Latest edition Cookbook. PLEASE NOTE: FREE Pizza Pan is Coated with regular Non-Stick also known as Teflon. 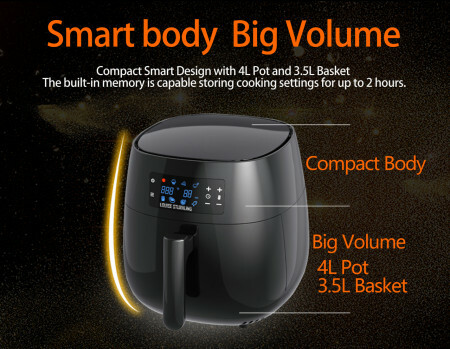 All I can say is that this ia a vry good air fryer. It cooks great and cleans with ease. Highly recommend. My siter-in-law introduced this air fryer to us. My wife and I both have respiratory allergies so even though we liked what we were hearing about air fryers we were not willing to buy one because of the teflon coating that is known to cause respiratory problems in birds. We bought this one the same day we heard about it and we donot regret our decision. It works great so far no allergy problems. Very easy to use and clean. I like to pretend I am in the bar at home with the game on and enjoying my air fryer buffalo wings. By the way, the Costco pre-packaged buffalo wings are the best in the air fryer. 400F for 10 minutes and you good to go. Bought 2 at the same time. One for home and the other for work. This thing does wonders to soggy sandwiches and letfovers. There is always a line queued at it now at work during lunch time. Please buy it for sandwiches and you will love it! I bought this air fryer mainly because of the ceramic coating. I read all the reviews on Amazon and Walmart about this product before purchasing it here from the manufacturer. I must say that I am very happy with my purchase. The ceramic coating is very easy to clean and programmed buttons are very helpful. I have just had it for about a month now and so far, I love it. I really like the auto shut off feature which I think makes the machine very safe. I have tried a chicken thighs in it and they were unbelievably great. You will stop using your microwave and oven after you get this machine. I am glad I purchased it. No more soggy fries filled with oil! Have your cake and eat it too. That is what you get with air fryer cooking. 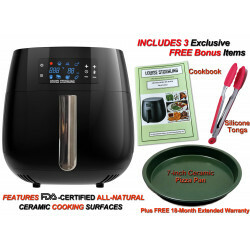 But with this particular ceramic air fryer, I like the idea that I can get the benefits of a great air fryer cooking and also don?t run the risk of getting BPA or Teflon in my food. Great product. I highly recommend it. I bought this air fryer because of the ceramic coating and so far so good. Nothing sticks and cleaning is a breeze. Highly recommend. I first heard of air fryers from my daughter who has been using a Louise Sturhling product for the past 2 years and she love them. She recently upgraded her air fryer to their new Ceramic model and recommended it to me. I have been using the air fryer for the past 4 months and even though I am a vegan and use it mostly for grilling fresh corn and other simple vegan foods, I must say that this cooker is a time saver. The preset settings are incredibly easy to clean. I just got a new vegan cookbook and I am very excited about all the things I can do with this air fryer. Great buy! I am blown away by what this air fryer can do. 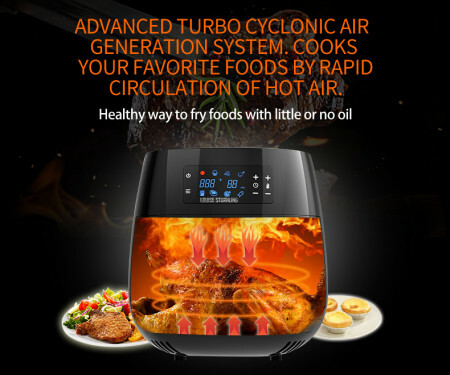 I am a steak-lover, so I was skeptical at first and wasn?t sure of this air fryer can give me a seared medium rare steak. After a couple of trials, I noticed that the preset setting of 400F for 15 minutes is perfect for most meats like chicken and steak, but to get a perfect sear I use the settings in the cookbook at 400F for 20 minutes (10 minutes for each side). Also, I found out that brushing the steak with a thin layer of olive oil or melted butter gives the best results ? a perfect sear each time. We are a family of 4 so we usually fit any size steak that will fit in the 4L pot. 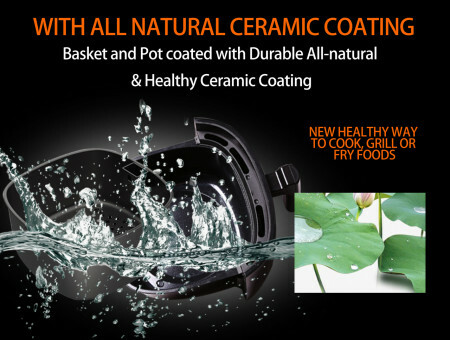 The ceramic coating is so easy to clean a truly non-stick. Now I can enjoy a good steak without heat that my oven releases into our house anytime we use it. We live in the California desert so anything that reduce the amount of heat in the house is great. I love this product! 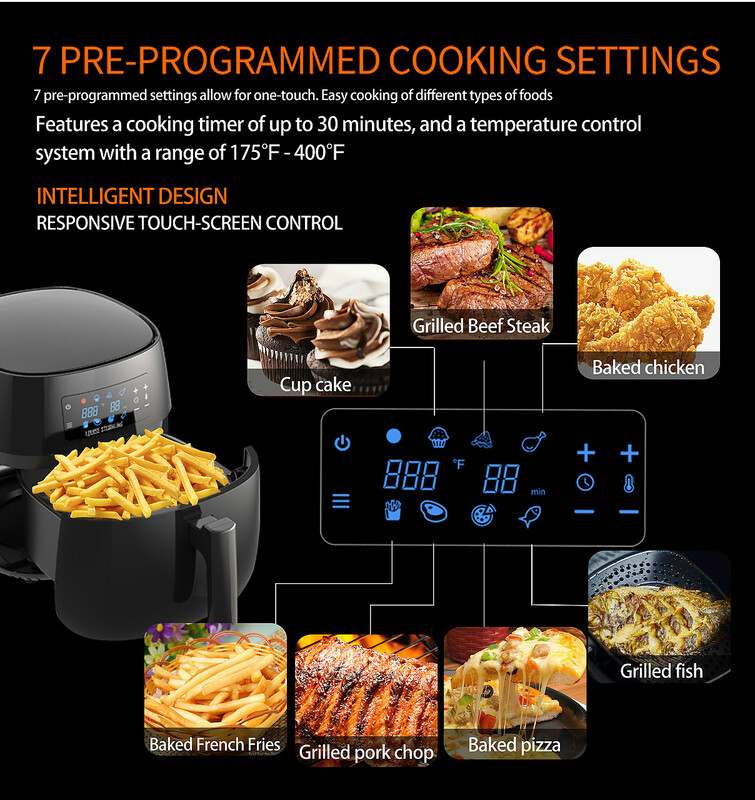 This air fryer is the best I have used so far since I started using air fryers 5 years ago. The ceramic coating is what attracted me to this product but after using it for 2 months I think the dual cooking surface design is the winner. Being able to use the pot independent of the basket is great. The detachable handle may need some improvements, but it works. Two cooking surfaces is always better than one. Please buy this one and you will not regret it. I like the product but the only reason I am giving a 3 star is the fact that by product arrived late and in a box that was heavily damaged. The product itself survived the shipping but the packaging was a mess. I bought this machine for my son who is not a great cook and does not like to cook. According to him, he first used it to make pre-packaged and seasoned spicy chicken wings from Costco his friends when they came by to watch a game. He said the chicken came out so good they had to run to the store for another pack. He is now cooking everything in the air fryer and he is in love with it. In All, I like how easy it is to us this air fryer. I can make nice grilled meat with this fryer without heating up my whole house like my oven does. I also like the natural ceramic coating very much. Nothing sticks to it. It is amazing. The only reason why I am giving it a 4 star is that you cannot change the settings like the time and temperature during cooking. I read a response to a review on Amazon and I think someone mentioned that it is a safety feature. I can see how that may be important if you have kids who want to play with kitchen appliances, but for a single guy like me I have no use for such a feature. I think it would have been good if one can change these settings during cooking. In all, I think this is a very sturdy well-made machine and very easy to use. Great product. It takes healthy cooking to a whole new level. I love it! I was impressed how good this machine can cook steak. Nice bbq feel on the outside but still nice inside with lots of yummy juices. Cooked the steak in the basket and all the bad fat drained out into the pot. This is the first time I enjoyed a steak without feeling guilty that I was clogging my arteries. Yes, with this air fryer, I can totally have my cake and eat it too!! Please get and you will not regret it! Thanks, guys, for the amazing support. I dropped my air fryer pot accidentally from my kitchen counter and broke the pot handle. All it took was a short phone call to get a replacement shipped to me. Even the shipping was free. These guys really stand by their product and their customer service support is A+ rated. I am getting your pressure cooker soon. Thanks again for the great support. 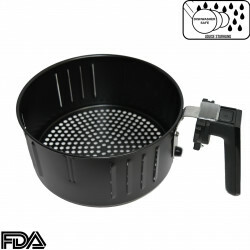 I heard a lot about Air fryers from my co-workers but while I liked the idea of cooking healthy foods with the least amount of oil, I did not like the fact that all the air fryers I came across had a Teflon coating. I finally found this ceramic coated one! I am very impressed with the quality of this product. 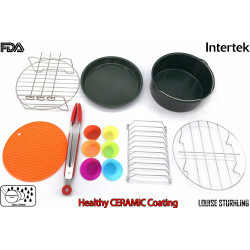 Very easy to use and nothing sticks to the ceramic surfaces. I also like the idea that you can use both the basket and the pot for cooking because the pot is also ceramic coated. The ceramic coating is also super easy to clean and seems very strong and durable. 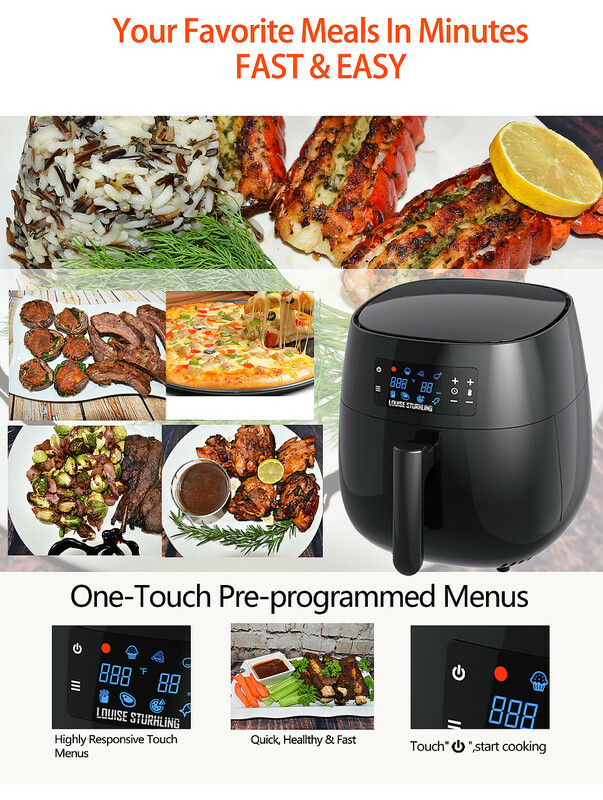 I have used it for fries, Salmon, chicken drumsticks and thighs and the whole family enjoyed the foods. Nice and crispy on outside but juicy inside. This is an awesome machine. I love it and will recommend it to everyone!